Raumfeld and its parent company Teufel have been players in German-speaking countries for years, but now they're getting serious about conquering the rest of Europe. We've just had a demo and were impressed by the audio, the look and the sheer German-ness of the new Raumfeld products soft-launching now, and getting the big UK marketing push from March 1. Where Sonos has the Play 1, Play 3 and Play 5 at £169, £239 and £339, Raumfeld presents you the One S, One M and Stereo Cube at £200, £350 and £400. So it's taking on the dominant force in multi-room without trying to undercut its prices. Pretty feisty. The One S is humidity resistant and can run off 110v or 220v plug sockets, so it can live in your bathroom - though we wouldn't exactly recommend chucking it in the bath. Particularly when you pair two of them as a stereo pair (hey - just like Sonos!) they sound incredbly impressive for their size. The One M is actually Raumfeld's Play 5 equivalent and offers similarly beefy sound from a similarly sized box. The Stereo Cube sits somewhere above the Play 5 and is, surprisingly enough, a stereo pair of cube-shaped speakers. These also sound highly impressive. That's not the end of it, though. Where Sonos has its offputtingly-priced, £279 Connect DAC, letting you stream Sonos-ly to your own hi-fi, Raumfeld has been smart and released its equivalent Connector DAC at just £149. Then there's the Stereo M, which we'd say is the pick of the products aurally, from our admittedly brief exposure to the range. 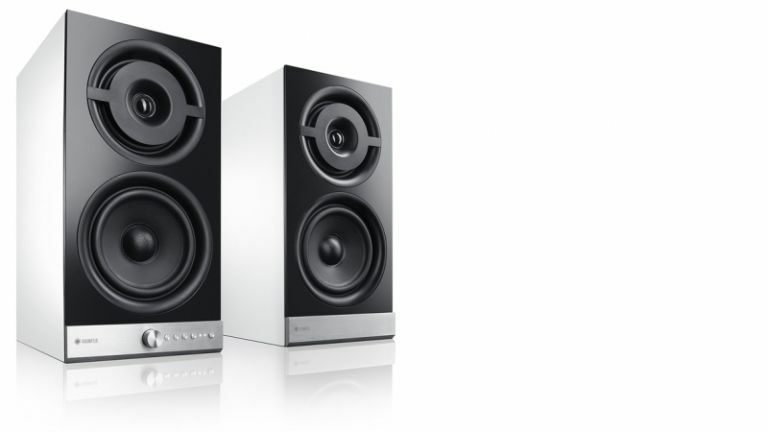 That's like the Stereo Cube but resembles a pair of bookshelf speakers, for £700 and their floorstanding big bros, the Stereo L for £1,250 per pair. The aesthetics of the range also places it above Sonos, for us, with a look that's pure, classic period Braun-style Vorsprung Durch Technik. Sonos' speakers look deliberately non-descript and classy but these are truly striking lumps of German engineering. Ironically, this probably makes them suitable for a smaller number of homes, but for the design-savvy, moneyed hipster market Raumfeld is obviously pitching for, it's perfect. The clever design isn't just skin deep. Another minor masterstroke here - assuming it works, and we weren't able to test, so don't be crying to us if it turns out it doesn't - is the employment of old-school FM radio-style, hardware preset buttons - and on the One M they're even retro, cassette recorder piano keys: genius. This means that, although general control is through your phone, PC or tablet, hold down one of the preset buttons for three seconds and you can then access whatever you're listening to at the time by pressing it once. And that can be Spotify, a playlist, a music library on a NAS, anything you like. That's seriously smart. With Sonos-matching features - a smart, slick app on tablet and mobile, support for a theoretically unlimited number of speakers, the option to play the same tune throughout your home, or a different song in every room, etc - and a few tricks the market leader doesn't have, like support for hi-res audio, Raumfeld's range could be a game changer. Later this year, it's also promising a soundbar (the One Bar), a flat subwoofer that can be wall-mounted, and streamers and speakers for home installation purposes.